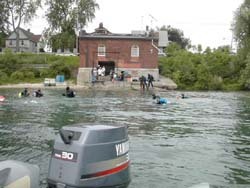 The upper Niagara River offers excellent opportunities for the novice to advanced diver. The current in the river ranges in speed from slow to very fast. When diving in strong current it is important to remember that you can not fight the current. It will win every time. If you find the current is taking you some place you don't want to go, relax and swim across the current toward a shoreline. You will probably end up walking back to your car but it will be a good day. Let the current be your friend and take you for a free ride. There are many great entry and exit sites along the river in the Fort Erie / Buffalo area. When selecting a site, please be respectful of private property and parklands. With our air conditioned clubhouse located on the sandy shore of the Upper Niagara at Fort Erie, the Underwater Recovery Unit offers visiting divers a place to assemble before and after a dive, washroom and shower facilities, air / NITROX fills, food, pop, water and many other services to make your dive a great one. Please see table below for pricing. The Fort Erie Underwater Recovery Unit, it's executive and members will do our best to ensure your dives are fun and trouble free. By agreeing to dive with us you acknowledge that diving is a dangerous sport. You are responsible for your equipment, experience level and safety. While we do everything we can think of to make diving safe, we make no guarantee of safety. You are responsible for your safety while at the club facilities or diving with us. Please think and be careful!